Our Deep Water Lingcod & Rockfish trip is no ordinary fishing trip. It’s extremely fun, lots of action, and tons of limits. Catching 20 pound lingcod are common on our boat, and 30+ pounders are caught several time every year. Because the fishery our of Coos Bay / Charleston, Oregon is noted for some of the best fishing in America. We take it to the next level, with over 45 years-experience fishing Coos Bay, Oregon, and Captain Curt Shoults knows all the tricks and locations for catching giant lingcod and Rock Fish. The giant lings are not where everybody else fishes, and certainly not in any single spot. Captain Curt uses his expertise to ensure your fishing trip is one to remember. This one of a kind deep water lingcod fishing trip is great for the entire family. Captain Curt will fish near shore 5-10 miles south of the jetty for those large tasty Lingcod, Sea Bass and many other types of rock fish. These trips are scheduled for 5-6 hours, and we offer two trips each day (during summer months) to pick from that start at 6:00 AM and 1:00 PM. Special Touch: The tackle and jigs used during our charters are custom designed and hand-made by Captain Curt and his wife Anette. That includes Flutter Jigs, Shrimp Flies, Lead Fish, Blade Baits, Copper Pipe Jigs, and other unique and effective tackle. 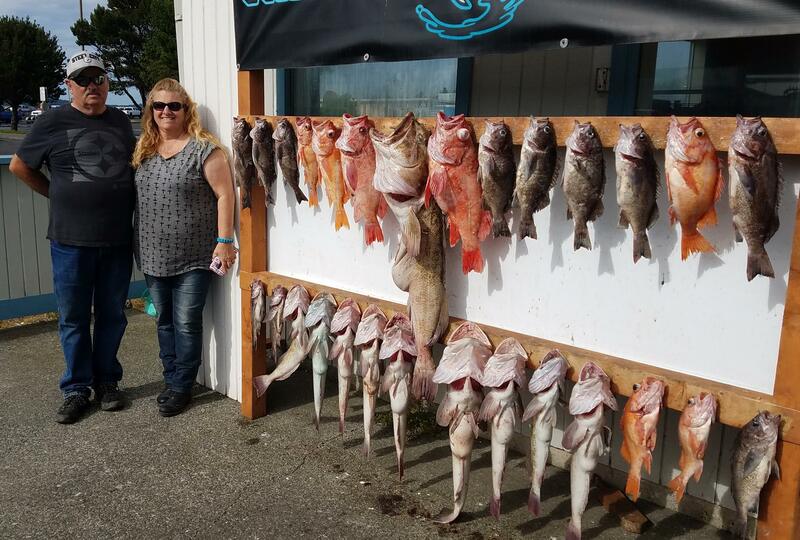 This is what makes Pacific Charter Services the best fishing charter on the Oregon coast. Bring a snack, your favorite beverages, a small ice chest, and a fishing license and you’re ready to roll. All rods, reels, tackle, bait, etc. are included in the price of the charter. And we limit our charter trips to 6 customers to ensure you get all the attention you deserve.